As a child growing up in a busy household with three younger brothers somewhere in the heartland of America, there was a portion of the grocery store that I never shopped in with my parents. The meat department. Years later, my new sister-in-law called me one day and in the course of conversation asked me if my family didn't drain the fat from the pan after we browned ground beef. I asked her why she would ask such an odd question and her response was that she and my brother argued over draining the fat from the ground beef. He didn't do it which upset her and he told her we never did that growing up. She, knowing my love of cooking and baking couldn't believe this. I was never a real fan of ground beef and had sat through many lectures at the kitchen table while a teenager after I picked out the ground beef from my chili or taco salad. A hamburger from McDonalds I could eat, but chunks of ground beef? Not so much. So it's no wonder that I never bought nor ate ground beef after graduating and moving out. It was only after speaking to my SIL and discussing ground beef that we came to the answer together; we didn't drain the fat because there was no fat to drain! My SIL's family grew up eating ground beef from the grocery store. My family grew up eating beef we bought straight from the farm and had butchered to our specifications. All our ground beef came wrapped in white butcher paper with our name stamped on it in red ink. Their ground beef came in a clear package with a bloody pad at the bottom of it. Our freezer was stocked full of white wrapped packages year round as we continuously bought our beef and ham this way. We knew no other way. And our ground beef, when browned, would yield hardly a teaspoon of fat, at that. There was nothing to drain. And now, about 15 years later it's come full circle as I prepare to buy half a cow from... my brother and SIL! Yes, they, still married and with three teen and pre-teen boys raise cows, pigs and sheep and have a few horses in the mix as well. His call this week was to see if we wanted a side of beef as he just took it to the butcher. It had to hang for about 10 days and then would be ready to cut to our specifications. I haven't a clue what I'm doing. I've never in my life bought a 'side' of beef but with three teenagers and a husband and a love of grilling steaks and burgers I'm anxious to cut down on our grocery bill and feed my family healthy, organic beef - raised by my own nephews and brother. The initial cost will be huge - probably $600-800 total (I have to find out the weight of the cow and decide what cuts of meat we want) but it's a good investment and hopefully we'll be set for beef at least until next Spring or Summer! I'll keep you up to date as I venture into new territory for me - as I know nothing about the process and will be calling the meat locker later today. Kraft has a secret recipe that I'm just hooked on... it's their Creamy Horseradish Sauce. First tried a few years ago on roast beef, I've since kept it on hand at all times for most of my sandwiches, be it turkey or even ham. It adds a zing I love without being too 'hot'. Even though I don't mind purchasing the bottle of dressing I'd love to be able to make a homemade version. So far I've not found one that comes close... but I continue to try! Here is another version I found and want to add to my files for collection although I think in the end I'm going to have to have a 'trial and error' day where I gather about 5 or 6 versions and tweak them all myself until I come up with something that works. Until then? I buy my bottle of delicious creamy horseradish sauce and search through recipes that look promising! It's a beautiful Sunday morning and I'm sitting at the kitchen counter reading the news and sipping my coffee. The sun is out, the sky is blue and it's the most amazing morning. I feel happy and relaxed and smile for no reason other than the burst of emotion that comes when I let myself relax and just 'be' in the moment. I do have to bring my teenage son and 2 friends to camp today but after I return, I have no pressing plans. Oh, the house could use straightening, dishes to be done and with three teens there is always another load of laundry I could do, but I don't work at the office today and we have enough groceries that I don't have to push through crowds to shop for bread and milk on my 'day off' this weekend and really, I can just relax if I wish. Which of course is exactly when I love to cook! Tonight I'll be using the grill of course - that's a given with me on as many summer nights as I can. I have almost 3 gallons of freshly picked green beans from our garden to use up and although I have 3 steaks thawed and ready to cook, my mouth waters at the thought of even more seafood. I'm always craving seafood! Thanks to Southern Living and their family of cooking magazines, I found this recipe and tweaked it only a bit before adding it to my files. See what you think! Peel shrimp, leaving the tails intact. Starting at tail end, butterfly each shrimp, cutting to, but not through, underside of shrimp. Combine the dill, onions, vinegar, capers, lemon, salt, honey, mustard, black pepper, hot pepper sauce and garlic in a blender and blend until smooth. Add the oil and water and blend again. Combine shrimp, 6 tablespoons of the vinaigrette, and red pepper in a large zip-top plastic bag. Seal and marinate in refrigerator 15 minutes, turning bag occasionally. Prepare grill to medium-high heat. Remove shrimp from marinade; discard marinade. Sprinkle shrimp evenly with salt and black pepper. Place the shrimp, cut sides down, on grill rack coated with cooking spray; grill 2 minutes on each side or until done, basting frequently with the remaining 6 tablespoons of vinaigrette. At our local high school in addition to the regular lunches, ala carte menu where you can buy pizza or a sandwich and the typical fruit, granola bars and other food choices, they also offer a special lunch choice that is often menu items that would be found in a restaurant or even another country. One of those foods caught the attention of my oldest daughter last year and she would rave about the Turkey Piegga. Always glad to make my own version of foods my kids rave about I decided to make a Turkey Piegga based on the ingredients my daughter remembered from her school lunch; spinach, some basil, bread, maybe some mayonnaise, and some cheese on a flat bread. Looking through my cookbooks and files, I didn't find it. Looking on the internet I found that it seemed to be a sandwich that only 'schools' across the nation made and called a Piegga. I couldn't find a clear, concise version that was similar to what my daughter was describing. Finally, giving up, I wrote to the head cook of the school and requested the information. She was more than happy to give it to me and to hear that one of the students loved it so much that they were trying to make it at home. I added this recipe to my files and I hope you do too! Olive oil – 1 oz. Italian seasoning – ¼ oz. Shredded Parmesan – 3 oz. Provolone cheese – 8 oz. Fresh basil – ½ oz. Mix together olive oil and Italian seasoning. Proof pizza crust to double in thickness, brush with olive oil/Italian seasoning mix. Sprinkle with parmesan cheese. Bake in a preheated oven at 350 convection oven 5-8 minutes. Cut into 10 pieces. Sandwich can be prepackaged and served cold or grilled on a Panini grill for 3 minutes to serve hot. I work at a non-profit organization that holds a huge 'gala' every year. Last night I attended a committee meeting for the planning of it and granted, it was about 6:pm and I was starving anyway, but when they were discussing food and said "heavy appetizers" my mind started to drift to various delicious, wonderful, fabulous appetizers. I love 'grazing' and I love appetizer style dinners. My whole family does. Small portions of various kinds of finger foods are the perfect 'dinner' choices for many NFL Football game days in our house. With appetizers on the mind I decided to start breaking out some old appetizer files of mine. This is one that looks pretty around Christmas time as the red and green colors are bright and colorful but of course can be served any time of year! Partially freeze the steak for ease of slicing. Cut into thin slices. Combine the steak, sauce and mustard and chill and marinate for at least 30 minutes. Cut asparagus and pepper into 2 inch strips. Boil, steam or microwave just until tender and drain. Wrap a piece of steak around a piece of asparagus and pepper and secure with a toothpick. Repeat until all the slices are used. Heat oil in a pan and cook until well browned. Serve! (You can get about 36-45 appetizers out of this). Melting Moments are one of the cookies my friends and I call a "Grandma" cookie. They are an old recipe, tweaked and loved by almost all. I often roll the dough into a log and chill or partially freeze to make slicing easy and then slice it into coins to bake. You can do them however you want. This version has a light layer of raspberry jam which I love and the glaze adds a drizzle of chocolate which others love. I make sure to use a simple confectioner's (powdered) sugar glaze with no chocolate for me! Both side by side are pretty though. In a bowl stir together flour, cornstarch and sugar. In a large mixer bowl beat butter until smooth, add flour mixture and vanilla. Shape into 3/4 inch balls and place 1 1/2 inches apart on an ungreased cookie sheet. Flatten crisscross style with a lightly floured fork. Bake at 375 degrees for 10 minutes or until edges are lightly browned. Makes about 6 dozen cookies. Melt and mix in double boiler or low in microwave but don't over cook! Shrimp... shrimp... shrimp. I could have it numerous times a week and never tire of it. I think I should just move to Florida or another coastal city so I could ensure myself a nice fresh daily ration! You might already make a version of this recipe as it uses the usual lemon, garlic and pepper but it's always nice to have a recipe to 'remind' you to make it. So what are you waiting for!? Here is a simple recipe you can make as a cake or cupcakes for your new neighbor (in honor of my best friend) and topped with either frosting and sprinkles or even just a delicious homemade whipped cream dollop this simple old fashioned milk cake can't be beat! Preheat oven to 350 degrees F (175 degrees C). Grease and flour a 9x9 inch pan or line a muffin pan with paper liners. In a medium bowl, cream together the sugar and butter. Beat in the eggs, one at a time, then stir in the vanilla. Combine flour and baking powder, add to the creamed mixture and mix well. Finally stir in the milk until batter is smooth. Pour or spoon batter into the prepared pan. Bake for 30 to 40 minutes in the preheated oven. For cupcakes, bake 20 to 25 minutes. Cake is done when it springs back to the touch. When it comes to recipes lately I seem to gravitate towards my favorite Southern Living cookbook. It's not surprising that one of the only emailed recipe 'newsletters' I receive is also stems from this company. This month they had some amazing seafood recipes, and as it's probably my number one favorite main dish foods, I dove in with excitement to see what new idea's they had. While most recipes are reinvented many times over by simply tweaking, and I already make a version of them myself, I saw this marinade and it caught my attention because it used an egg! Already tweaking it - (as my readers know I never follow a recipe completely and always tell you to play with your food!) I found a tweaked version that added a bit of key lime and honey to it. Yum! I am adding it to my files because it just looks too delicious to pass up! Place first 3 ingredients in a blender; process until smooth. With blender on, add oils in a slow, steady stream until blended. Add seasoned salt and remaining ingredients; process until smooth. Cover and store in refrigerator. Use as a marinade for shrimp before grilling. Long time readers know that I love mango's and am a long-time fan of mango salsa. 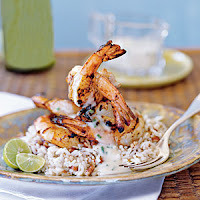 I'm also a huge fan of grilled shrimp and I think I could have it for dinner 5 nights a week and be perfectly content! 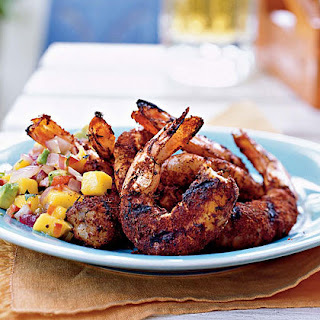 This recipe comes from David Bonom in Coastal Living's January edition and combines the grilled shrimp I crave with the mango salsa I love. If you have Jamaican Jerk seasoning in your cupboard and shrimp in the refrigerator or freezer, consider this one for tonight. Combine the mango, avocado, bell pepper, cilantro, lime juice, sugar and salt to make the salsa and set aside in a bowl. Peel shrimp, leaving tails on; devein. Toss shrimp and onion with oil in a large bowl, sprinkle with Jamaican Jerk Rub, and toss to coat. Grill shrimp and onion over medium-high heat (350° to 400°) 6 minutes, or just until shrimp turn pink, turning once. Chop onion and add to salsa mixture, stirring gently. Serve shrimp with salsa. It's early Saturday morning I'm sitting in my kitchen, at the laptop, with the patio door open to an unexpectedly chilly morning and a hot cup of freshly brewed coffee. For my daily readers following the process of my experience with my Keurig, I do indeed have another update. 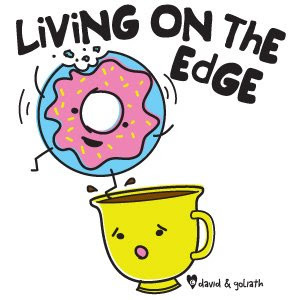 My long time readers were there when I had my first cup of coffee brewed in a Keurig last year. I was determined that would be my next coffee maker. When our BrewStation started to leak all over the counter (a model flaw in that particular model I've since found out) I took the opportunity to invest in the Keurig I had been longing for. My latest update? A new Keurig that we swapped out at the store on Thursday. It's only been two days but it's been primed properly and I'm enjoying my third cup of coffee from it thus far. So I still love Keurig and I'm hopeful our new 'swapped out' machine will give us delicious, freshly brewed coffee for a long time! It's early Friday morning after a very full, stressful week. On Wednesday of this week I had decided that I would do a video of me drawing the name of the winner but this morning as I sit here with my eyes barely wanting to stay open, the work involved in doing an 'almost live' drawing is just too much. (I'm chuckling as I type this). Instead we'll just do the typical random name drawing with no video... not this time anyway. Perhaps for the next contest! 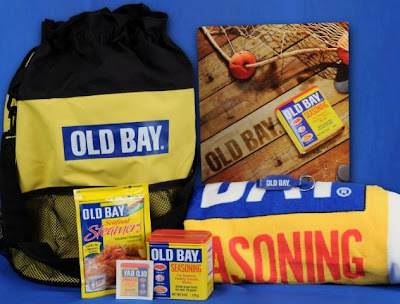 OLD BAY seasoning is celebrating their 70th Birthday and want to share in the summer celebration. They've offered to ship a beach bag full of goodies to one lucky winner. I will email the winner to get contact information and then in turn send it to OLD BAY as they are completely in charge of shipping the winning prize. Are you ready??? Jen, I'll email you this morning. Congratulations! And if by chance I don't hear back from the winner by 6:am tomorrow morning (24 hours) I'll choose a new winner from the list of names that entered. Thanks so much! And be sure to visit OLD BAY's website for many delicious recipes... including dips, appetizers and more! For my everyday readers I thought I'd update you that I am sitting here this morning sipping coffee made in my old 'back up' coffee maker. The Keurig wasn't working again yesterday so my husband took it to work with him this morning and will return it to the store. We are hoping we just got a lemon and a new model will work longer than the two weeks we had this one. It didn't seem to be a clogged nozzle issue, instead it was something in the electrical system as most of the buttons wouldn't work, not even the 'menu' button. The only button that worked was the power button. It worked for a day and a half and then would stop again. As much as I hate returning items, it must be done. In the meantime! My quest for a copy cat recipe of the delicious condiment; Kraft's Creamy Horseradish Sauce. How I love this stuff! I've been keeping my eyes open for recipes similar or some that I may be able to tweak to make a match and so far I've not found one as good as the real thing. Still, I persist as I am hoping I can make a similar product for pennies on the dollar. Here is one I found and added to my collection in my quest for a comparible. My notes from this hand written recipe said it was a very very old recipe from the upper East Coast. I've not made this one yet, but it's from my collection of old recipes. Have you tried it? If so, what did you think? Soften the gelatin for 10 minutes in the milk. Dissolve the sugar in the coffee and whisk in the beaten egg yolks. In a saucepan, bring to a boil over medium-high heat, whisking constantly. Remove from the heat and whisk in the gelatin-milk mixture. Return to medium-low heat and whisk for two minutes more. Cool the mixture to room temperature. Beat the egg white with vanilla til it holds stiff glossy peaks. Fold gently and thoroughly into the coffee mixture. Pour into little molds or dessert dishes and chill. There will be a thin clear dark-coffee layer on the bottom, then a creamy cafe-au-lait layer, then a fluffy top. Very refreshing on a hot day. Good with a dusting of cocoa powder on top. The taste of homemade shredded beef taco's is delicious and really can't be beat if you have the time to make it. Using a slow cooker helps since it cooks without any work on your part! Here is a recipe that starts off as a Southern Living recipe but with the addition of some extra spice gleaned from adding bits and pieces from other recipes, you end up with a tasty meal that is perfect for a summer party in your back yard. Sprinkle beef evenly with salt and cook beef, in batches, in hot oil in a Dutch oven over medium-high heat 5 to 7 minutes or until browned on all sides. Remove, reserving drippings in Dutch oven. Add 1 tablespoon chili powder, cook the drippings and seasoning, stirring constantly, 1 minute. Stir in tomato paste. Add 2 cups beef broth, and stir, scraping bits from bottom of Dutch oven. Return beef to Dutch oven, and stir. Place beef mixture in a 4 1/2-quart slow cooker. Add onion and next 4 ingredients. Cook on high 4 hours or on low 6 hours or until beef is tender. Serve with warm tortillas and desired toppings. For a spicy blend, add into a food chopper; 5 garlic cloves - diced ; the juice of 3 lime halves; 2 Tblsp chopped fresh cilantro; 1/2 to 1 tsp crushed red pepper flakes; 1/2 jalepeno pepper seeded and chopped. Add this to the meat while cooking in the slow cooker. Don't Forget to Enter for a Chance to Win a Beach Bag! Sipping my morning coffee (yes I'm still using the Keurig... it seems to have overheard me threatening to take it back and it's behaving perfectly for the last two days) and just reminding my readers and those new to the site to check out the post below for a chance to win a summer beach bag bonanza from Old Bay Seasoning! Totally free to you - all you have to do is email me to throw your name in the hat. (Your name isn't passed along to anyone and I don't keep it for anything - I just use it to contact you if you are the winner!). In honor of Old Bay todays recipe is for a zesty party dip you can serve with vegetables, crackers or chips. It's quick and creamy and can be especially pretty when served in a hallowed out bell pepper! Mix sour cream, mayo and onions with the Old Bay seasoning and chill at least 1-2 hours for the flavors to blend before serving with crackers, vegetables or chips. This makes about 2 1/2 cups. Shrimp Bruchetta Appetizers and a Chance to WIN a Summer Beach Bonanza from Old Bay! On my websites I often talk about the beach, post recipes for seafood and dream about the day we can finally relocate there... even if I'm 80 years old before this happens! For the time being God see's fit to plant us in the Midwest and we trek to the beach once a year to soak up as much sun, sand and surf as we can. In the meantime I make seafood in some capacity here at home at least once or twice a week. Anyone who makes seafood even once or twice a year probably has a tin of OLD BAY seasoning in their cupboard. I have (no lie... brace yourself here) 3 large tins of regular OLD BAY seasoning and a small tin of the their new Garlic Herb blend seasoning and a small packet of a trial of yet another new version. Yes, you could say I'm an OLD BAY fan. But not just for seafood! It's a 'secret' ingredient in many other recipes including fried chicken, grilled chicken, pasta salads and mashed potatoes! Todays recipe is Zesty Shrimp Bruschetta. Bruschetta comes from the Italian word buscare, which means "to roast over coals." Preheat oven to 350°F. Mix shrimp, tomato, green onion, olive oil, egg white, OLD BAY and garlic powder in medium bowl until blended. Slice bread into 24 (1/2-inch thick) slices. Place on baking sheet; broil until lightly toasted on both sides. Spread lightly with mayo, then spoon shrimp mixture evenly over bread slices. Bake 8 to 10 minutes or until heated through and lightly browned. And now for the CONTEST! The legend of OLD BAY began in 1939 with German immigrant Gustav Brunn, who settled in Baltimore and developed the perfect secret seasoning for steaming the crabs that were so popular among the people there. Originally called "Delicious Brand Shrimp and Crab Seasoning" sometime later he renamed it OLD BAY Shrimp and Crab Seasoning after a steamship line that traveled the Chesapeake between Maryland and Virginia. They are now celebrating their 70th 'birthday' and want to share their summer party with you by sending one lucky winner a Beach Bonanza package that includes a great beach bag, beach towel, a bottle opener, OLD BAY seasoning and more. Perfect for a day at the beach, a shrimp boil and cold drink. I will chose one lucky reader at RANDOM from all those who enter by 6:am on Friday, July 17th. Old Bay will ship the package directly to you after I contact them with the winning name and address so be sure if you enter I can reach you with a WORKING EMAIL addy to get your shipping information. If I can't reach the winner within 24 hours I'll draw a second name instead. How do you enter? CLICK HERE to email me and place your name in the 'beach bag' for a drawing Friday morning!!! It's time to dig out the recipes for vegetables as we 'dig' out the harvest from this years garden! From just 4 short little 8 foot rows of green beans we've harvested about 3 gallons of beans in just 1 1/2 weeks. The carrots are just now ready and the jalapeno's, green and red peppers along with the tomatoes are coming in wonderfully. The onions are on their way and the garlic will be ready to pick once the leaves are 50% brown, but with the scapes trimmed they are now just growing in size. My cucumbers are just getting started; a bit slow this year and last. I'm not quite sure why but I saw a tiny 3 inch long cucumber on the vine this morning so I know it won't be long! Did you listen to my advice this past Spring? Did you put in your garden? Even just a tiny one? My garden is quite small and manageable but it's still enough to supplement our grocery budget and allow some 'me' time alone in the garden in the evenings to weed of course, but also to spend time with my own thoughts, prayers and some times even a song or two. Such a blessing gardens are. Two weeks ago we invested in a Keurig coffee brewer. I raved about it to my friends, I sent the link to their website to two of my coffee loving friends and posted about it on two of my websites. 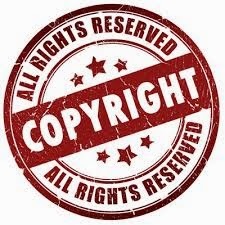 I decided that the bad reviews it was getting online about it not working was because the people who wrote them must not have primed it properly when they first bought it or they were not cleanly it properly or descaling it. I made up many excuses as to why this wonderful machine would not work for others. Also in the back of my mind was the employee at the car dealership where I had my first Keurig coffee, who had to come fix the machine twice, both times I was there. She said their machines jam constantly and break down continuously but that Keurig knows this and that Keurig doesn't even 'fix' their own machines anymore. They just come out every 6 weeks or so and give them a new machine and take the broken one. The dealership gets the machines for free and they just buy the coffee so they continue the 'broken machine' cycle because they aren't really out any money by doing so. Today, just two weeks after purchasing and using our Keurig Coffee Brewer, it stopped working. This morning I enjoyed two cups of coffee before my husband was up for the day. He brewed one cup and left for work. After he left I decided to have one more cup while I read the online news. The machine said it was ready. The lights blinked, asking me which size to brew. But when I pressed the button? Nothing. Soon I found none of the buttons were responding, not even the 'menu' button. I of course tried to turn the machine off, unplug it for a bit, cleaned the nozzle with a paperclip to be sure it wasn't plugged (it wasn't) and removed and returned the water reservoir to it's place. Nothing. Once in a great while it decides to spit out about a tablespoon of hot water (I'm not wasting coffee k-cups, I'm just trying to get straight water to come out) but a tablespoon of hot water is about all it gives, and only every 8th or 9th attempt. The hot water it gives in that tablespoon is completely clear with no grounds and really, it can hardly be very dirty after only two weeks of use! My husband said he will try to return it to the store as I've heard and read it's a major pain to deal with Keurig directly. Hopefully because it's a new purchase, the store will accept it as defective and let us return it. The big question? Do we get another Keurig or do we admit that the reviews are right and they should be avoided? Update: I've had a number of emails asking me if I updated again after this article. Yes... unfortunately I did have to update again. And again. You can find the most recent one here. The short version? We were on our 3rd Keurig brewer in 4 months. Although my family thinks me a nut, I'm a 'plain vanilla' kind of girl when it comes to ice cream, a 'double helping of vegetables' instead of chocolate cake and a 'plain cake donut with white frosting and colored sprinkles' kind of girl when it comes to pastries. As a child growing up in a tiny town in the Midwest I remember being about 10 years old and walking to the corner gas station/convenience store early on Sunday mornings. Although I'm sure they wouldn't do it now, the employee working used to let me go into the back kitchen area where they made their donuts fresh every day and I actually would make the donuts - hot grease and all. I then got to frosting and sprinkle or sugar them and after 'working' for a half hour or so would be rewarded with a box of a dozen fresh donuts to take home. I adore cake donuts (and crullers) and consider them one of my top 10 comfort foods. In a large bowl, combine flour, sugar, baking powder, soda, salt and nutmeg. Whisk to blend. Stir in the buttermilk, melted butter or oil, vanilla and eggs. Don't over beat. Mix just until moist. Chill dough for about 30 minutes for easier handling. Heat your oil to 375°. On a well floured surface, knead dough for 2 minutes just until it is no longer sticky and is easy to work with. Using half of the dough, roll out to 1/2" thickness; cut with a floured doughnut cutter. Slip doughnuts into the hot oil and fry for 1 to 1 1/2 minutes per side, or until deep golden brown. Drain on paper towels. Dip in powdered sugar or a cinnamon sugar mixture or wait for them to cool a bit before frosting. In 2002 I started to make this summer chicken salad and about once every summer I continue to make it when the craving becomes overwhelming. My kids aren't big fans of salads that combine fruit and chicken - probably because I'm not either (!) but this is one that caught my eye and my taste buds years ago and I just adore it. My hint is to not skimp on the chicken in this one... nor the pecans. Add more if you like, but not less! Combine the mayonnaise, vinegar, honey and poppy seeds. Cook the chicken and dice or if your chicken is partially frozen, it is the perfect texture to chop or dice before cooking. Cool. Combine the chicken, dressing, grapes and pecans with the celery. or chop after it's cold for ease in cutting. The poppy seed and honey dressing is amazing. Serve on a bed of lettuce or inside a scooped out melon. Malt-O-Meal Co. is voluntarily recalling oatmeal that contains instant nonfat dry milk that may be contaminated with salmonella. The instant nonfat dry milk came from Plainview Milk Products Cooperative of Minnesota which is recalling products made over the past two years due to the possible contamination. Many of Plainview's products were sold to other food makers. Minneapolis-based Malt-O-Meal is recalling "Maple & Brown Sugar Instant Oatmeal" sold in cartons and variety packs with best-if-used-by dates of June 30, 2009 to Oct. 28, 2010. The oatmeal is sold nationally under brands including Cub Foods, Diamond Crystal, Fastco, Flavorite, Foodland, Good 'n Hearty, Hearty Traditions, Hy-Top, IGA, Mom's Best Natural, Megaroons, Millville, Our Family, Richfood, Shop 'n Save and Smart Menu. My husband and I are misplaced Midwesterners. We live where his job takes us but our heart is way down south, somewhere near the ocean. We travel to the beach every year and the rest of the year, dream of it. 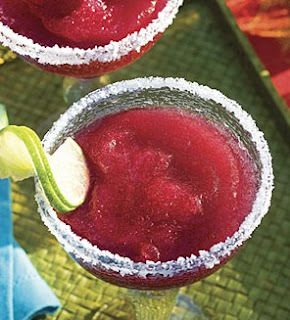 When I saw this frozen beer margarita recipe in Southern Living about 2 years ago (?) I copied it down but not being a beer person I never made them. The little umbrella and the pastel colors make me think of Florida... the ocean... and blue sparkling waters. Mean while I'll sit and sip my morning coffee while I look at miles of corn fields! I'm bringing it out of my files and into my collection in the hopes that some of my readers are looking for just this type of drink to serve to their guests this holiday weekend in the USA. Enjoy! Stir together first 3 ingredients until well blended. Fill 4 medium glasses with crushed ice. Pour limeade mixture evenly into glasses. Add beer to taste. I love pomegranate juice. I love margarita's (only the slushy frozen kind!) and I love making color-coordinating drinks for the holidays. 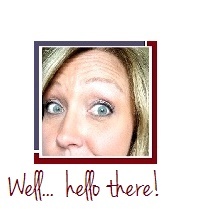 So this Fourth of July weekend I'm a on a roll to bring my readers some red, white & blue to add to their festivities! Process first 5 ingredients, and, if desired, pomegranate seeds in a blender 30 seconds or until frothy. Rub rims of 6 glasses with lime wedges; dip in salt to coat. 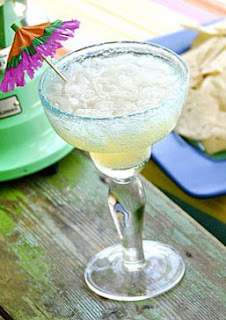 Pour margarita evenly into prepared glasses. Garnish, if desired. Serve immediately. Not being much of a drinker I've only had Sangria a couple times in my life. The first was at a home party of a good friend in Minnesota. I found it to be delicious and fruity and perfect to serve to guests on a hot summer evening. I personally like 'frozen' drinks when I do have one. I'm a girly girl I guess (or a kid at heart) but the slushy drinks win out for me or else I'll just sip a Diet Coke or ice cold water. This Sangria is fun! It's fruity and slushy and I can just taste how good it would be this Fourth of July as well as looking good on a table decked out in red, white and blue! Now it starts with pre-made or pre-bought sangria from the store and then is doctored up a bit. But a delicious alternative is to start with the same amount of Cranberry juice. This is a good option if you holiday party includes children or others who prefer not to drink alcohol. Place a large (2-gallon) zip-top plastic freezer bag inside another 2-gallon zip-top plastic freezer bag. Double bagging helps with avoiding leaks or spills. Place bags in a large bowl. Combine sangría, limeade, and lemon-lime soft drink in the inside bag. Seal both bags, and freeze 24 hours. Remove mixture from freezer 1 hour before serving, squeezing occasionally until slushy. Transfer mixture to a 2-gal. container. Stir in fruit. When I was in high school my Mom was able to buy certain grocery foods in bulk through her place of work. On a whim she bought a large (very large!) container of frozen ground chicken. It was using this ground chicken that I 'made up' chicken chimichangas for my own family and then after high school when I married my husband I continued to make them using a large can of chicken as it was just the two of us and one large can of cooked chicken from Costco fed us. Now, with 3 teenagers we certainly don't buy that anymore but use cooked, chopped or shredded chicken that I grill or cook myself. This recipe comes from my files. It's not the one I usually make but very similar and of course I ALWAYS tell my readers; Play with your food! Add and delete spices and ingredients that you know your family loves or hates.... make it your own! Combine 1 1/2 cups of the salsa or picante sauce with the chicken, onion, cumin, garlic, oregano and salt. Microwave or cook in a saucepan with a lid covering for about 20 minutes. Place about 1/3 cup of the filling onto a flour tortilla and top with a mound of cheese (2-3 tablespoons). Fold in 2 sides of tortillas to enclose filling. Fold over top and bottom edges of tortillas, making rectangles. Secure with wooden picks. Place, folded side down, on greased baking sheets. Spray the chimichangas with cooking spray (like Pam) or brush with oil. Bake at 425° for 8 minutes; turn and bake 5 more minutes. Remove picks; top with remaining picante sauce and serve with the delicious toppings. It's the holiday weekend here in the US and many are gearing up for backyard barbecues, grill outs, picnics, camping and pool parties. 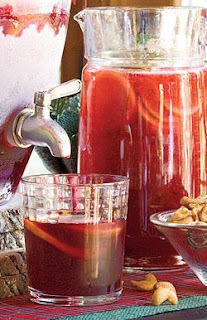 In May we started to talk about summer drinks for adults (alcoholic) and I hoped to bring you a lot of new ideas to try. I haven't counted them but I think we've gotten up to about 10 or so. Let's see if I can get my readers a few more to add to their collection to try this weekend. A typical Mojito will have just sugar, lime, mint and rum. But as with every recipe, you can play with it a bit and see what you get. 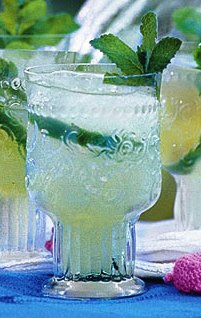 I think this recipe I found through Southern Living sounds more like a margarita but the addition of mint makes it a mojito. See what you think. Make a simple sugar syrup by bringing 1 cup water and the sugar to a boil in a medium saucepan. Boil, stirring often, until sugar dissolves. Remove from heat; add mint sprigs, and let stand 2 hours or until mixture is completely cool. Pour mixture through a wire-mesh strainer into a pitcher, discarding mint. Stir in lemon-lime soft drink, lime juice, and tequila. Serve over ice. Garnish, if desired. The other night at dinner my 13 year old found out through the course of our family conversation that mayonnaise had eggs in it. "Eggs?!" she exclaimed, she didn't believe us. "Honey, mayonnaise is eggs. Whipped with a bit of oil and some spices. That's why you can make cakes with it." "You put mayonnaise in our cakes!?" She was even more aghast. Perhaps this was more information than she wanted! Ha ha. "Well yes, your favorite chocolate cake that I make with the whippy marshmallow like frosting? That cake is made with mayonnaise." Yes indeed, mayonnaise is... eggs. And delicious eggs at that! Such a fresh taste you'll want to smear it on everything from a grilled turkey burger to a tomato, lettuce and bacon sandwich. There are many (many, many, many) versions for homemade mayonnaise. Some are basic with little flavor, some are intense with crazy additions, others are a basic mild spicy version even a delicious hint of lime. Here is just one version that includes just a touch of spice to give it a great flavor. Combine the eggs, lemon juice, mustard, and hot pepper sauce in a blender or food processor. Blend 5 to 10 seconds and with the processor or blender still running, add the oil in a very slow stream through the opening in blender cover. Drizzle it slowly and don't rush it as you want to incorporate the oil. Blend until smooth, scraping sides occasionally for even blending. Add just a tiny dash of salt to enhance the flavors of the spice. Season to taste.